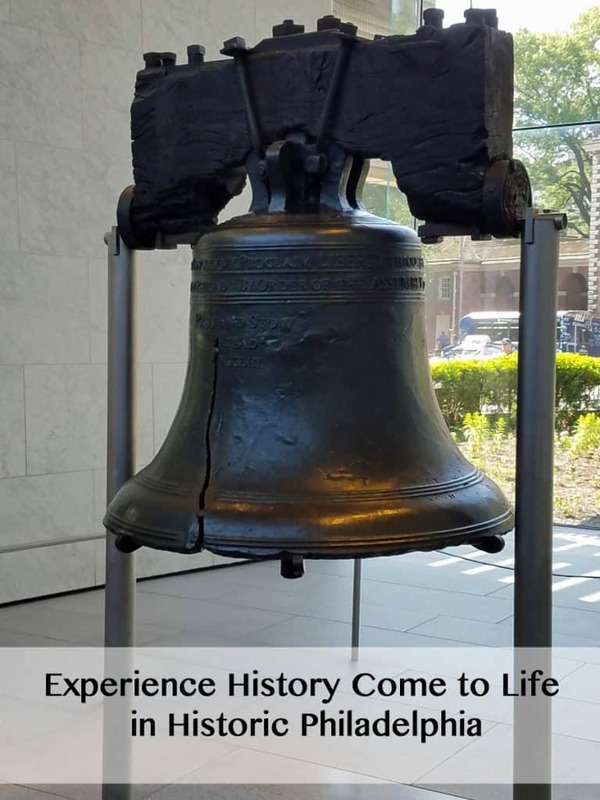 Monday is Independence Day and what better way to celebrate than telling you about the fabulous experience I had visiting Historic Philadelphia this year. I admit that even though I’m from the Pittsburgh area that I have never spent much time exploring the history of the other side of the state. Of course, I knew about the Liberty Bell and Independence Hall, but what I didn’t know was how interactive this history could actually be. This trip was sponsored by American Heritage Chocolate in conjunction with Historic Philadelphia and it gave me the opportunity to experience the history of Philadelphia in a way that I never could have experienced from a history book alone. We began our tour where it all began, Independence Hall, with a reading of the Declaration of Independence. 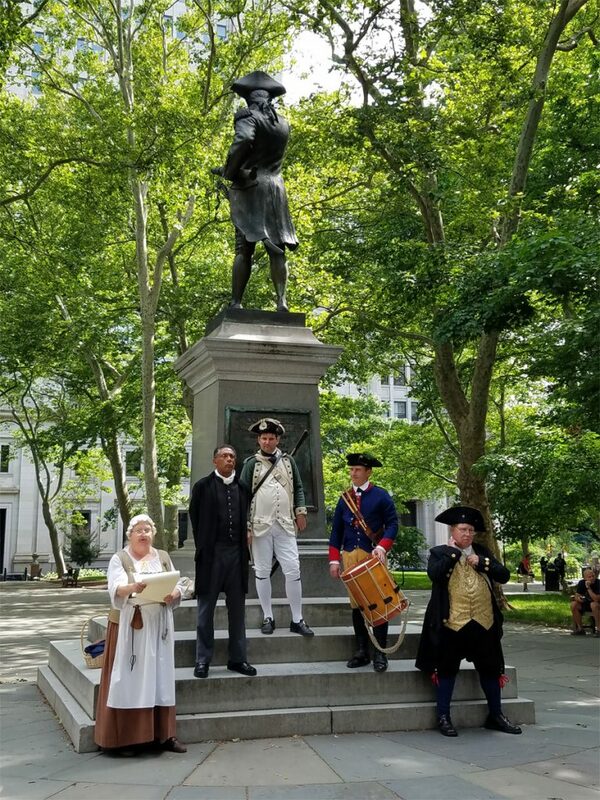 However, this reading wasn’t done by Thomas Jefferson or Benjamin Franklin, but by characters who represented actual people who lived in Philadelphia in the colonial times. After the reading of the Declaration of Independence, we began our adventures by going on part of the Tippler’s Tour. This tour allows visitors to experience Philadelphia’s pub culture with stops at four modern day watering holes and one historic tavern. Our tour guide was Trooper Haire, one of the city’s History Makers, who was dressed in traditional colonial clothes and showed us the sites along the way to the different pubs. After visiting two of the stops on the Tippler’s Tour we headed back to Independence Hall for the Independence After Hours tour. This is such a unique way to experience Independence Hall. Since it is with a small group you are really able to see and take in the history of the hall. I found it really powerful to be able to stand right behind where the Pennsylvania delegates table was and see where the Declaration of Independence was signed. 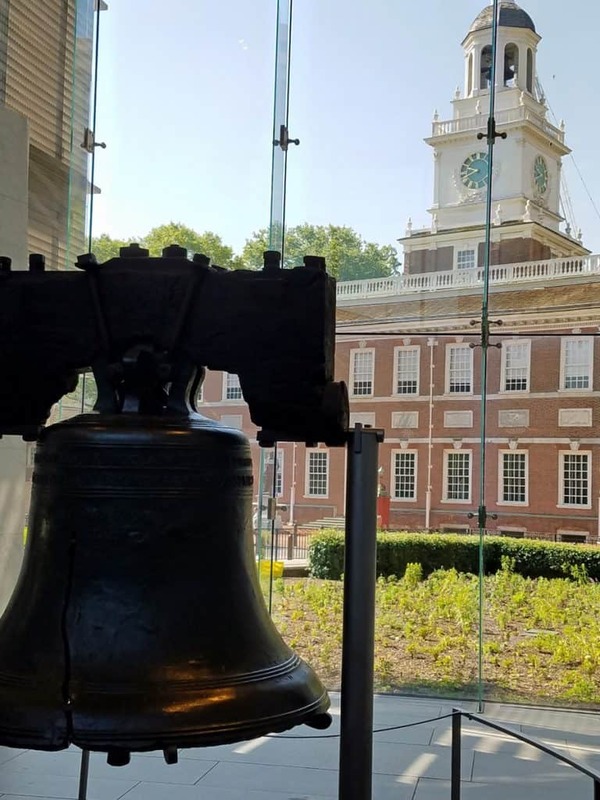 Being able to experience Independence Hall in such an intimate setting wasn’t the only highlight of the Independence After Hours tour, however. 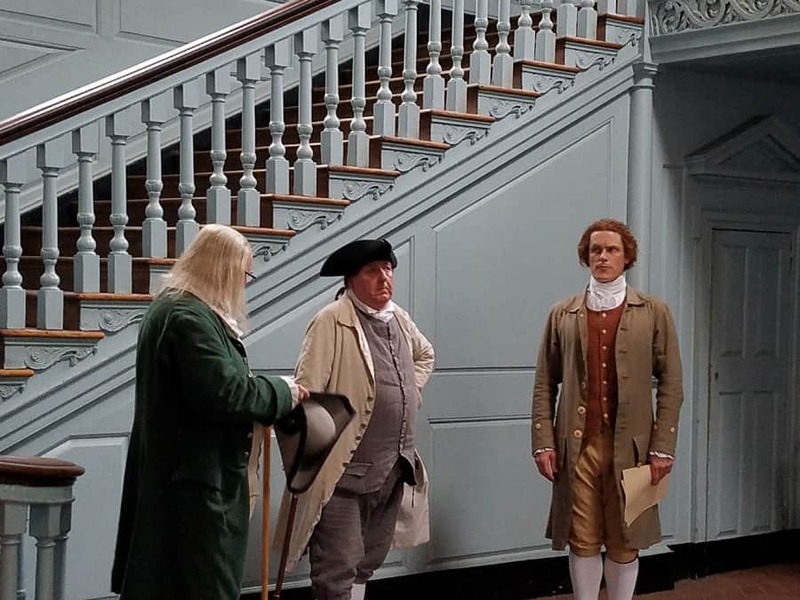 After observing the hall itself we were surprised to stumble on an argument between Thomas Jefferson, John Adams, and Benjamin Franklin regrind the wording of the Declaration of Independence. Just seeing this reenactment gave me the chills! After the Independence After Hours tour was over, it was still early in the evening so several of us took a walk over to Franklin Square where we were able to check out the fountain and even ride the carousel. Saturday proved to be even more eventful than Friday. We began the morning with a walking tour of the Christ Church Burial Ground (where several signers of the Declaration of Independence are buried), as well as the Free Quaker Meetinghouse and the Liberty Bell. 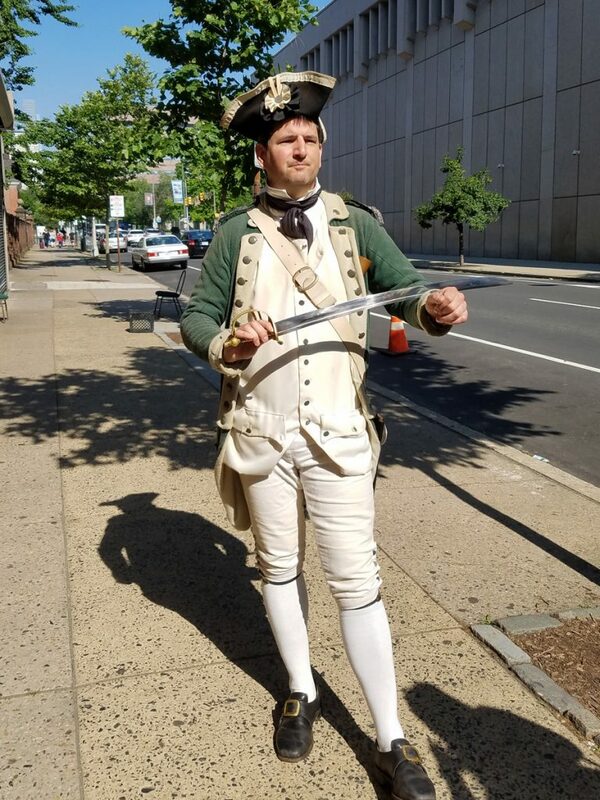 Our tour guide for this tour was also one of Historic Philadelphia’s History Makers, which represent actual historic figures (although lesser known) who have been meticulously studied by the actors of play them. Our guide was Major Samuel Nicholas. Of course, no historic tour of Philadelphia is complete without seeing the Liberty Bell. Just being able to stand in front of the bell and see Independence Hall in the background is awe-inspiring. 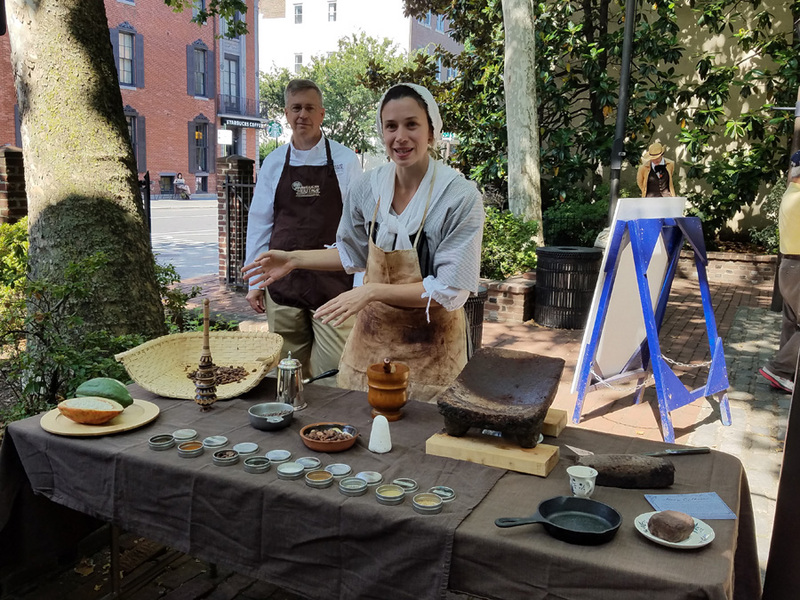 Our next stop was at the Betsy Ross house where we witnessed a chocolate making demonstration presented by American Heritage Chocolate. We got to see how cocoa beans were ground and made into chocolate not only for baking but also for drinking! Yes, you read that right. Back in colonial times people would actually drink chocolate. I am not talking about the kind of hot chocolate that we are used to either. I am talking about a drink made from melted chocolate. We all had the opportunity to try a cup, and trust me, just a cup was enough to fill you up. 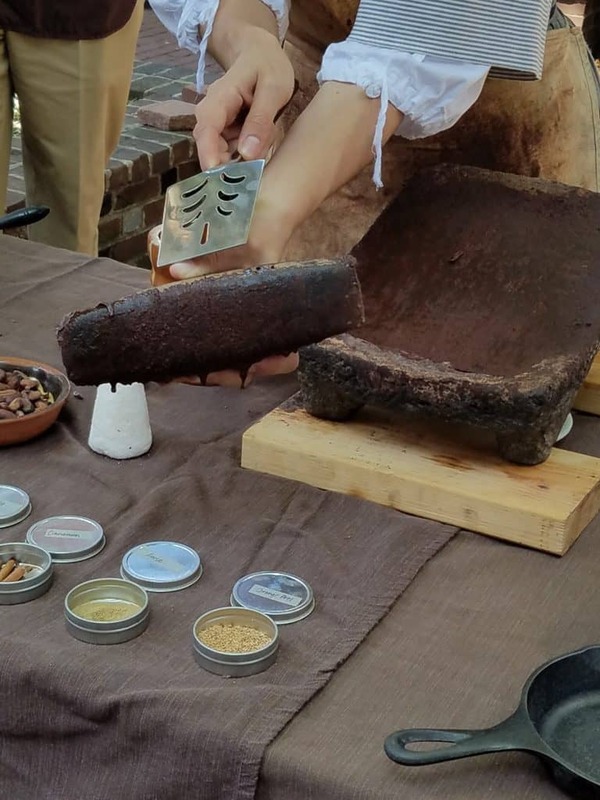 American Heritage Chocolate is working to preserve chocolate’s place in American history by producing an authentic historic line of products developed from recipes from the 1750s. This chocolate is reminiscent of what Thomas Jefferson, George Washington, and Ben Franklin would have enjoyed. Mildly spicy, and slightly sweet, American Heritage Chocolate is flavored with a blend of spices and ingredients available during colonial times such as cinnamon, nutmeg, chili pepper, orange, anise, and vanilla. 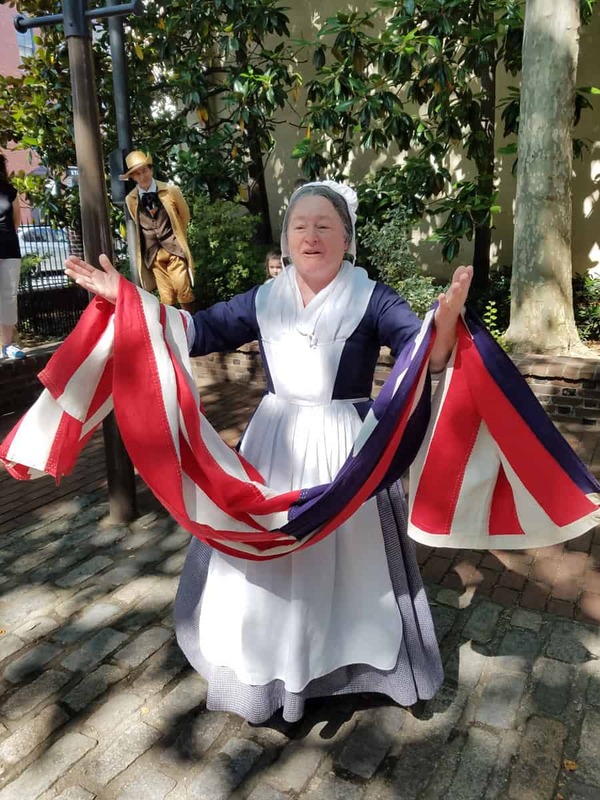 The American Heritage Chocolate, which was available in the gift shop of the Betsy Ross House, is made with all-natural ingredients, no preservatives, and artisanal dark chocolate containing 63% cacao. After the chocolate demonstration we toured the Betsy Ross house and even had a sewing lesson with Betsy. An interesting fact that I learned during this tour was that when George Washington had asked Betsy Ross to sew the original American flag, he had envisioned it having 6-pointed stars but Betsy convinced George Washington to go with 5-pointed stars as they were easier to cut out (with only two cuts!) than the ones that he envisioned. That is how we ended up with the 5-pointed stars on the flag today! A great (free!) program that is available in Historic Philadelphia are the 13 Once Upon a Nation Storytelling Benches. At these benches, scattered throughout Historic Philadelphia, visitors can listen to a story about our nation’s history. Children are given paper flags and for each story they listen to get a star sticker. Once they have gotten all 13 star stickers they can then get a free ride on the carousel in Franklin Square. The stories ranged from well-known figures in history such as George Washington, to lesser known ones such as Fanny Kemble. 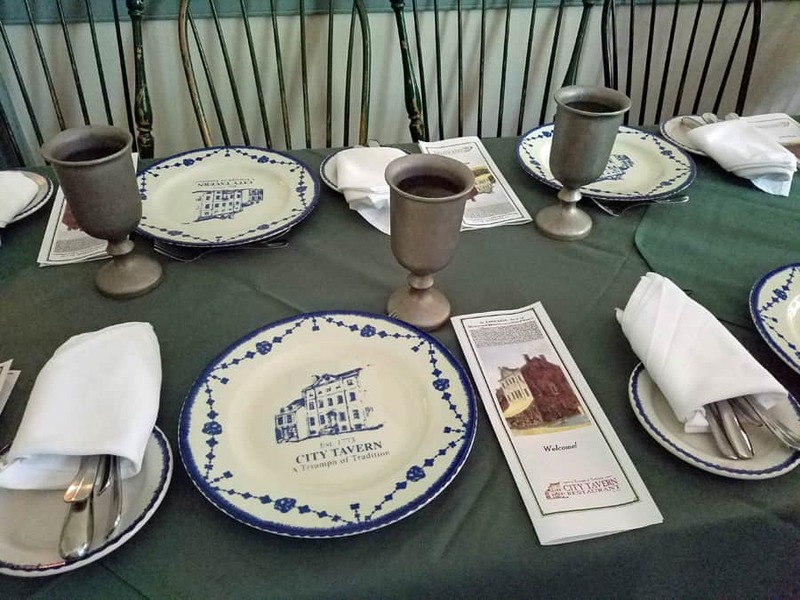 We ended the day (and our Philadelphia tour) with an authentic colonial lunch at the City Tavern. The City Tavern was constructed in 1773 and was the site of the city’s first Fourth of July celebration in 1777. The original tavern burned down in 1854, but the entire building was reconstructed in the 1970s and re-opened in 1976 for the United States Bicentennial as a functioning tavern and restaurant. 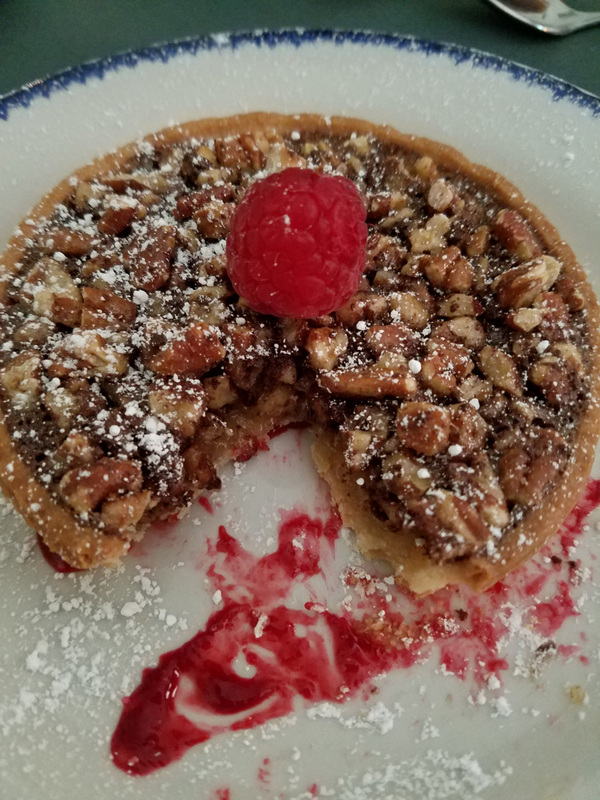 At the tavern we ate traditional turkey pot pie and finished with American Heritage Chocolate bourbon pecan pie for dessert. Although it was a whirlwind trip, I left Philadelphia anxious to come back and learn more. I felt as if I just scratched the surface of all there is to do, and to learn, in Historic Philadelphia. Since Philadelphia is only six hours from Pittsburgh I’m sure that I will be back (with the kids!) soon! What a wonderful place to spend time and tour. I love the chocolate making, who knew they used to actually drink chocolate. . So much history in one place–I would love to take my family there! I have to visit Philly soon. I live so close and never go its a shame. Amazing place for history and apparently chocolate! YUM! What a great tour and neat glimpse into history! My family would love to visit Philly! I’d love to try the After Hours tour and the Tippler’s Tour! I’ve never been to Philadelphia, it sounds wonderful! Fall would be perfect! Philly is an awesome city, especially for vegan food! Glad you had a great time! When we go on vacation we always try to include some type of learning experience from the area.